Have you ever gone to grab a vase for your fresh flowers and realize that what you have doesn’t quite fit the stems or the height isn’t right or the mouth is too big for the buds? I’ve got a few solutions to help you out, and you probably have these items laying around in your house right now. 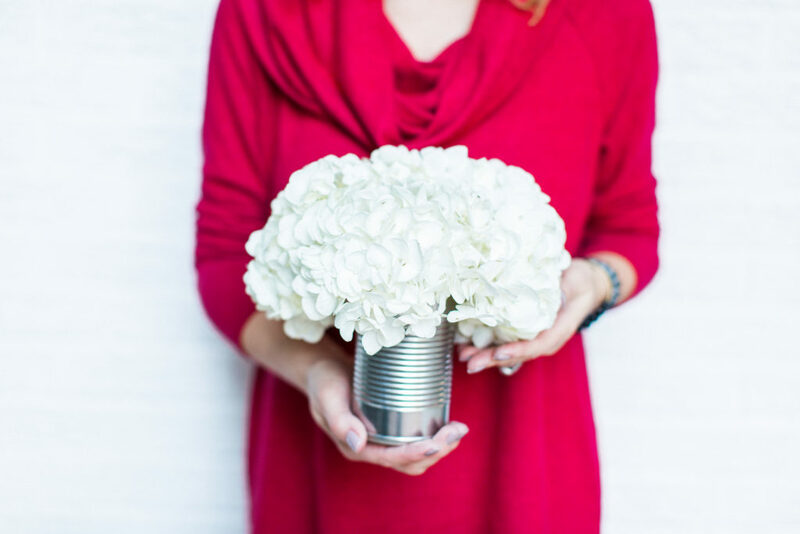 White hydrangeas are one of my favorite flowers, so I’ve used these to show you how it can work for all of these containers. Come jump on the repurposing train . . .
Who doesn’t have a can of cream of chicken soup in their pantry? After you’ve made your comfort food casserole (nom nom), clean out the can, remove the label and voila! You can’t tell me you don’t have a can of expired soup in your pantry. Here’s your solution! 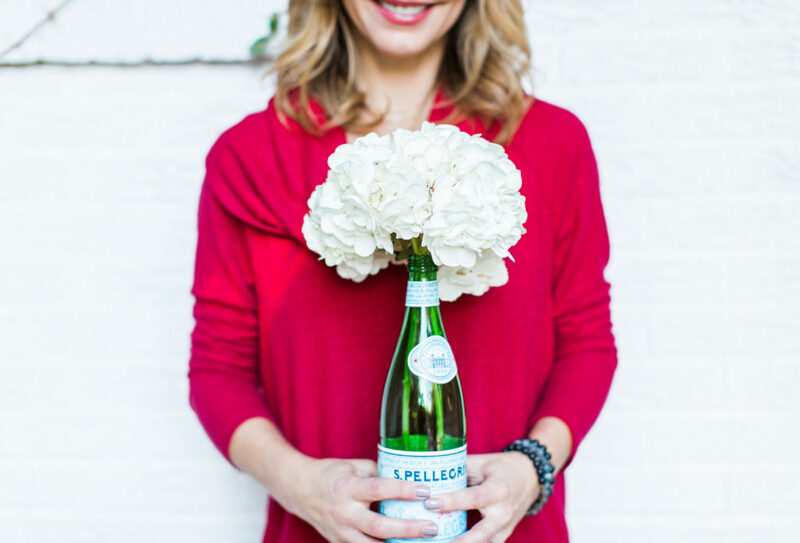 Glass bottles look beautiful when paired with white blooms. I’ve found that World Market has a great selection of imported water bottles in pretty hues and shapes, so I will buy them to color coordinate with my table. Simply set the chilled bottles on the ends of your table for guests to refill their drinks, and repurpose them as vases after your party. Some of the labels are quite interesting – as long as they look good, keep them on for added charm. Cobalt blue bottles are such a striking contrast with white flowers. I drink sparkling water non-stop so these are a no-brainer for me. Buy in bulk at Costco or a big box store and you have instant vases for your next party. Keeping the label on makes it seem more authentic to me. While they may seem too big for flowers, pitchers work well for taller stems and tend to have a smaller mouth, so they keep the blooms in place. 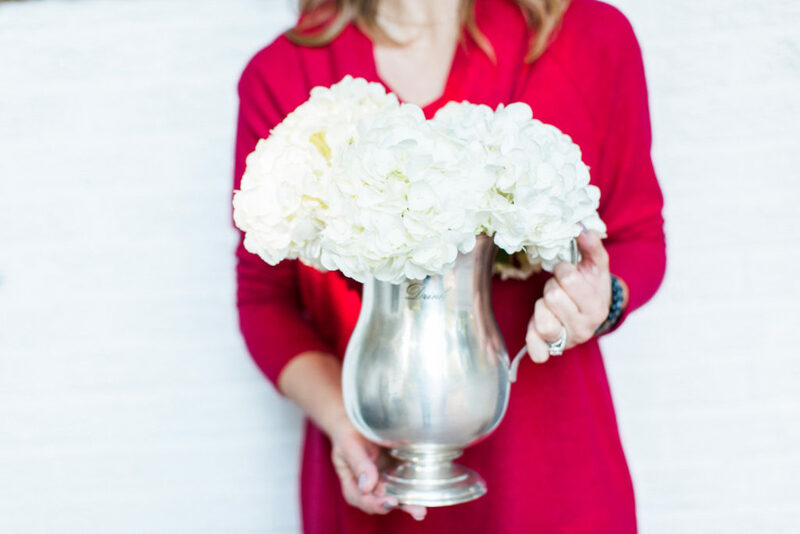 This vintage-looking pewter pitcher is one of my favorites – it makes me dream of being a Southern belle and drinking sweet tea on a porch somewhere fabulous. Sigh. Okay, it’s no secret I love my wine and I especially love rosé in the summer. This particular bell-shaped rosé wine bottle is perfect for a long-stem single bloom and costs about $20 at Total Wine. Place 5 of these down the center of table and it instantly looks simple and chic. Rosé wine? Yes please. Using the bottle after you’re done? Bonus! Keep the creative ideas coming! 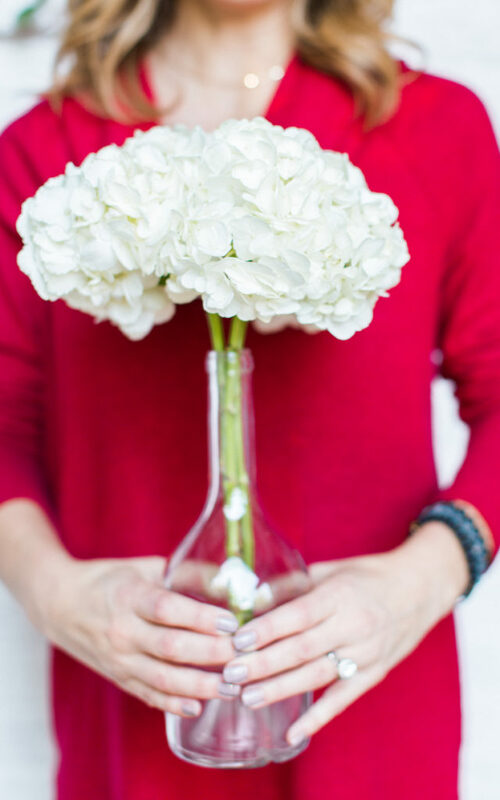 I’d love you hear what you’ve repurposed for fun flower vases! I once had an event where all the vases were the tomato cans from Pane Bianco-the labels are colorful and of course, from Italy. They thought I was a little kooky asking them for their empty cans! An inexpensive yet impactful way to display flowers. Thanks for the fun post!